The Lighting for Tomorrow competition spotlights breakthrough products in the lighting arena with a strong focus on innovative design and energy efficiency. The fierce competition encourages lighting manufacturers to think outside of the box and bring better solutions to market. The 2015 winners are in, and we have some favorites of our own. Here are some prize-winners that caught our attention throughout top categories in the competition. In the LED Indoor Fixture category, the sleek and modern Auri by LBL Lighting is a show-stopper. 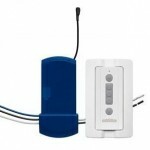 It is designed to resemble the ear buds we associate with audio electronics. 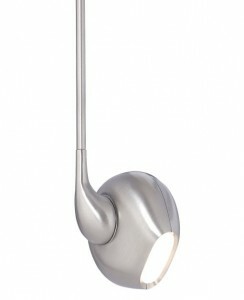 But an oval-shaped LED optimized by an internal reflector makes it a powerful lighting option, despite its modest size. Bonus: It rotates 360 degrees, and pivots 350, to distribute light virtually anywhere you need it. T he 24-in. Ambrose Pendant by AFX, Inc. is an everyday option that is thoughtfully designed with the aging population in mind. It provides bright, uniform LED light distribution via a smooth white diffuser. The pendant’s high light output is thought to be senior-friendly by offering maximum visibility. In the Lighting Control category, fanSync by Fanimation was unveiled as a means of controlling the ceiling fan and lights via Apple or Android device. It’s no surprise that we are big fans of wireless lighting control (Link to our wireless control from iPad piece if appropriate) for convenience and safety. What struck us with fanSync is the ease of use as well as the full range of control, from fan speed and direction to lighting and timer capabilities. In the LED Replacement Lamp category, the 100W Replacement General Purpose Bulb by GE Lighting won our hearts. It is extraordinarily efficient, using just 16 watts to provide 1600 lumens. 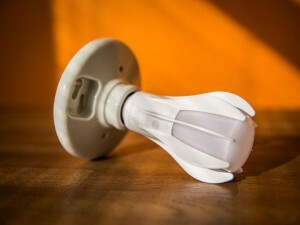 The bulb boasts an impressive 25,000 hour lifespan. It is sure to become a standard in general purpose lighting. For more on this cutting-edge competition or the latest lighting products that could make a difference in your home, visit the Lighting for Tomorrow website.